Released this past December, the NeoGeo X apparently won't be produced anymore. According to Japanese site Gamer, production for the system is ending as of this month. Even though the machine carried the SNK and NeoGeo brands, the console was not designed and manufactured by SNK. Instead, it was the work of tech company Tommo. Gamer does not give a specific reason as to why production is ending so quickly, but, as the box says, it was a limited edition console. That could be why. Back in December, it was announced on Game Watch Impress that production for the machine would be ending, with a TBA for the next time the system would be imported into Japan. No word on how this impacts regions outside Japan. Kotaku did reach out to SNK for clarification, but did not hear back before this story was published. 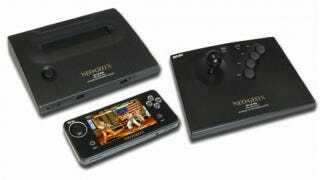 It sounds like the NeoGeo X will continue to be supported as there are still plans to release more SNK games for it, as well as a screen protector for the NeoGeo X handheld and an AC adapter. Update: Siliconera reports that only the "limited edition" NeoGeo X units are out of production. The original report from Japanese site Gamer did not make such a clarification.